Any thoughts, other than I'd be crazy to try? The Man O Wars actually compliment the Greenbacks quite nicely, so I figured I'd mix 'em up and see what we get... help a brother out!!! As for loudness, the eminence will be as loud as the 2 greenbacks together. 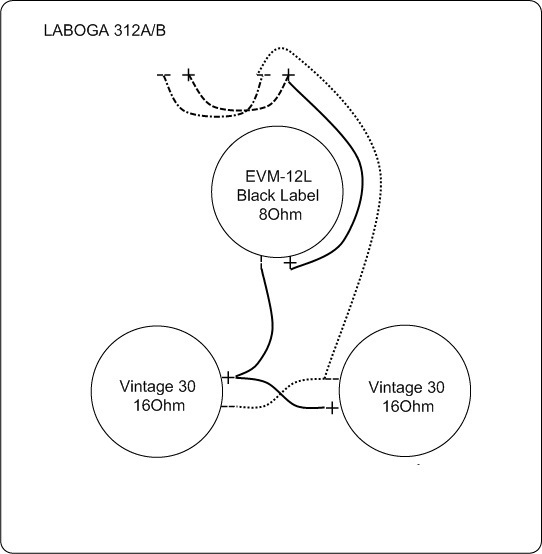 Laboga has a 3x12 Cab (http://www.laboga.pl/en/312a-b#description). You basically wire 2 16ohms speakers in parallel (=8ohms) and then go to the 3rd speaker which is 8ohms in series = 16ohms total in mono. While the 4x12-into-3x12 cabs might be a good idea, I'd be sure to cover the unused 4th hole to maintain the original acoustic integrity of the box. LOVE IT... nice to know it's running at 16ohms so no danger of blowing anything up... so... my next questions... the MOW are 120 watts, and the Greenies are 25 watts... what is the total per cab? THANK YOU! Everything sounds so even and clean now!!! Thanks for posting this! I have heard of other guys running 3 speakers in their 4x12s but always wondered about how to wire them up. I may try this with my EV and two Celestions. I can put one of the other Celestions in my 1x12 cab after taking out the EV. Dante, let me know how it goes! I'm going to try this 3-speaker arrangement with 1 EV Force (150w/8ohm full range speaker) and two Celestion G12F 60 Rockdriver Jrs (I think) that are in the cab. I can't find a lot of info on the Celestions online. I think they were proprietary to H&K. I have a question; what would be the best arrangement for this? Should I put the two 60w speakers in the bottom and put the EV up top with the open hole? I suggest this because the EV sounds pretty bright by itself. Get 2 pieces of decent multilaminate/plywood from your local wood supply store/Home Depot and make a new/2 new baffles, single 12"" hole bottom center, 2 12" holes top. EV in the bottom, Celestions (the Celestion/H&K OEM Rockdriver 60s are variants of the V30) top.